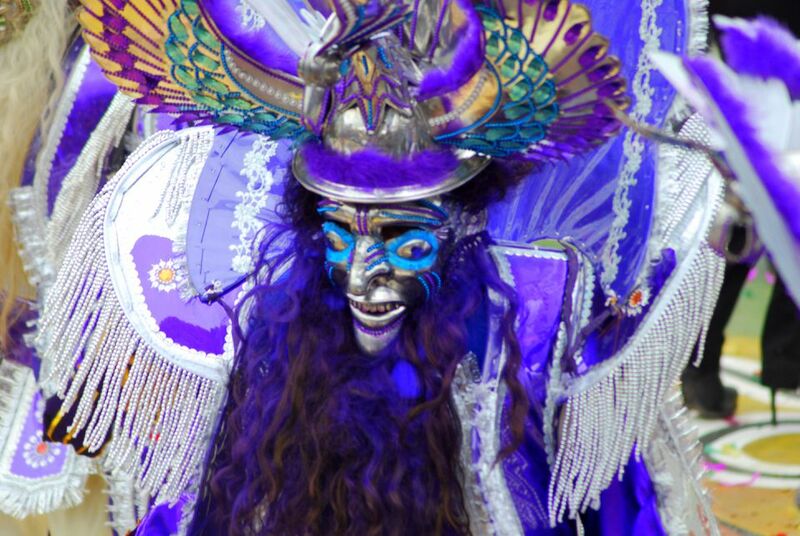 In Bolivia, Oruro, Santa Cruz, Tarija, and La Paz hold carnivals but the Oruro carnival is the most famous. It takes place for the eight days preceding Ash Wednesday. Unlike Carnaval in Rio where the escolas de samba choose a new theme each year, Carnaval in Oruro always begins with the diablada or devil dance. The diablada is a centuries-old ritual surviving unchanged from colonial days. Next, are hundreds of devils in monstrous costumes. The heavy masks have horns bulging eyes fangs long hair and in contrast to the frightening masks, the devils wear sparkling breastplates silk embroidered shawls and golden spurs. Between the devils' groups of dancers dressed as monkeys pumas and insects caper to the music from brass bands, or pipers or drummers. The noise is loud and frenzied. Out of the devil dancers comes China Supay, the Devil's wife, who dances a seductive dance to entice the Archangel Michael. Around her dance the members of local workers unions, each carrying a small symbol of their unions such as pickaxes or shovels. Dancers dressed as Incas with condor headdresses and suns and moons on their chests dance along with dancers dressed as the black slaves imported by the Spaniards to work in the silver mines. Family members led by the matriarchs in yellow dresses appear in order: first, the husbands dressed in red, next come the daughters in green, followed by the sons in blue. The families dance their way to the football stadium where the next part of the celebrations takes place. Two plays begun, as medieval mystery plays, are enacted. The first portrays the Conquest by the Spanish conquistadores. The second is the triumph of the Archangel Michael as he defeats the devils and the Seven Deadly Sins with his flaming sword. The results of the battle are announced the Patron Saint of the Miners the Virgen del Socavon and the dancers sing a Quechua hymn. The Oruro carnival is over 200 years old and is considered an important religious festival - so important that it has been recognized by UNESCO as one of the Masterpieces of the Oral and Intangible Heritage of Humanity. While it was once an indigenous festival celebrating Andean gods when the Spanish arrived, so did Catholicism and so it evolved with Christian icons. Today it is a mix of pagan/indigenous traditions along with Catholic symbolism incorporating ritual around the Virgin of Candelaria (Virgin of Socavón), which is celebrated on March 2. While South America has a strong Catholic population, many of the biggest celebrations were once ancient, indigenous ceremonies that evolved to incorporate the Catholic faith. This is also true for the Day of the Dead, which evolved into the Christian All Saints Day. Although the references to the Spanish conquest and the downtrodden state of the Bolivian peasants are very clear, this festival is based on the pre-Colonial ceremony of giving thanks to the earth-mother Pachamama. It commemorates the struggles of good and evil and the early Catholic priests allowed it to continue with a Christian overlay in an effort to pacify the local natives. Watch what you drink - chicha hangovers are awful! Enjoy carnaval / carnival wherever you are!